Web.2.English כלים מקוונים למורי האנגלית: Digital Flashcards - What can you do with Quizlet? 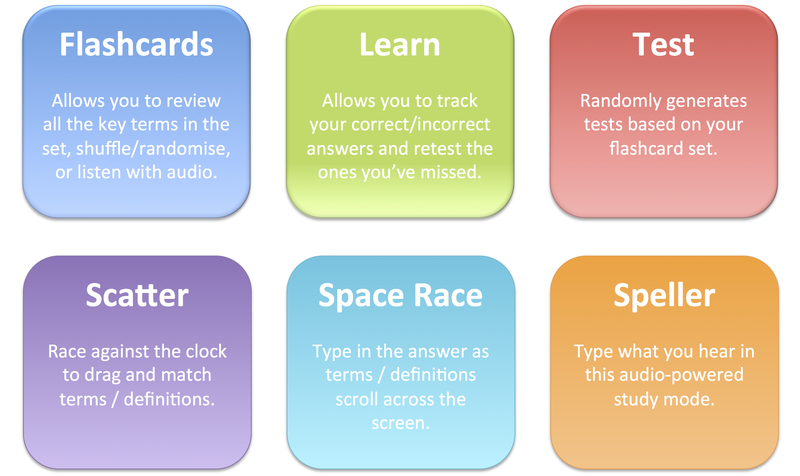 Digital Flashcards - What can you do with Quizlet? Quizlet is a website that gives the students motivation to learn vocabulary - it is simply fun! On quizlet, student creates sets of words and translations, or words and definitions. It is also possible for the teacher to create the sets for them. The sets of words are kept in every student/teacher account and they can practice any time - on the computer or the smartphone app. You can also search sets of words on any subject, save them as your own, edit and share them with your students. Another good feature is adding pictures. This is great for your visual learners. You can add a picture to any word and it will be presented on the flashcard. I use it for all the vocabulary we have in the textbooks. The kids search the meaning of the words in the glossary of the book, and insert it into the app to create flashcards. It gives them the option to review and practice the words by themselves. What do you - or the students - do? 1. sign up to the website. 3. Choose the language for the term and for the definition. Quizlet does not read aloud Hebrew, but it recognizes it and will read aloud the English definition. 4. When you finish, name the set (the students can copy the name from the textbook), and click "create". 5. Now, a set is ready. the students can use the flashcards, practice with 3 different exercises and 2 games. The teacher can click on the test and print out a test for the students. English definition - more skilled students can choose both term and definition in English. Quizlet suggest definitions and the students should choose the right one. Search - you can browse the many quizlet sets other teacher have prepared according to the subject you are going to teach. Once you find something interesting, you can save it and edit it for your purpose. My students love it - Try it yourselves!